If you're an iPhone or iPad owner, iOS 9 has launched for your device. The update hit as expected right around 10:00 PDT (San Francisco), 13:00 EDT (New York), 18:00 BST (London) and 03.00 AEST (Sydney, Sept 17). 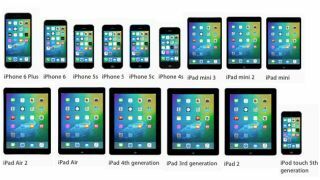 A wide range of devices are eligible for iOS 9 too, with all iPhones from the iPhone 4S upwards, all iPad Minis and every iPad from the iPad 2. And for those of you rocking a 5th generation iPod Touch, then you'll also get some iOS 9 action. To get iOS 9, head to Settings > General > Software Update on your device. While iOS 9 is updating on phones and tablets now, the initial launch didn't go smoothly. A number of users (techradar editors included) received a "Software Update Failed" message when they tried to update to iOS 9. The message noted "An error occurred downloading iOS 9." The problem was likely due to the volume of users trying to download iOS 9 at once, backing up Apple's servers. Several users have reported success updating via iTunes on Mac.